Roastalicious! Leg of Lamb with roast potatoes and garlic beans. There is a Sufi proverb that says that food eaten in anger turns to poison. So surely that means that food eaten in a state of happiness turns to love! 🙂 There is nothing better than inviting good friends to your home for a catch up over a meal cooked with lots of love. That’s why I’m a big fan of roasts – they are simple and easy to prepare, you just bung it in the oven and leave it until it’s done. It’s a meal that allows you to go out and talk to guests instead of having to constantly run in to check the stove. 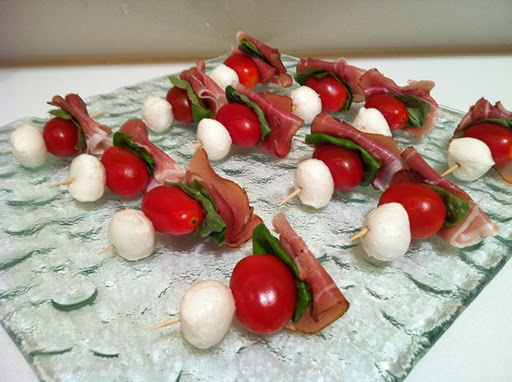 If you’re not preparing a starter – I am a huge fan of the appi plate. Just stick a large pretty plate on the coffee table with a selection of olives, bread, cherry tomatoes, and a prepared appi for people to enjoy while waiting for the fat lady to sing. This time I prepared ham, a mini mozzarella ball, basil leaf and a cherry tomato :-)I woke up at 9.30am, made myself a cuppa, and started on my dessert, a classic Victoria Sponge from my current cookbook read, Cook with Jamie. It’s a super easy recipe, and very hard to get wrong. I know this for a fact because I don’t bake a lot, it’s the first time I’ve made a sponge and it was easy as pie, so to speak. ♥ Preheat the oven to 180°C. Prepare two 8″ round cake tins: grease the bottom and sides, line the bottom with greaseproof paper and lightly dust the sides with flour. ♥ Beat the sugar at the butter together until white and fluffy. Add the eggs one at a time beating each one in well before adding the next. ♥ Fold in the flour and the lemon zest. ♥Divide the mixture evenly between the two pans, using a spatula to spread it out evenly, then bake for 20 minutes until brown and risen. Let cool a little then rest on a wire rack to cool completely. ♥ Gently warm the jam in a pan, then remove from heat and add the fresh strawberries. ♥ Whip the cream with the sugar, lemon juice and vanilla seeds until you have nice soft peaks. If you don’t have vanilla pods, you can always substitute with real vanilla essence. ♥ Saving the most attractive sponge for the top, place the other on a serving platter. If it’s a little too risen in the middle, take a knife and slice off a bit to make it flat. Spoon on your strawberry mixture, then spread out the cream on top. Leave a bit of room at the edges for the mixture to spread when you add the top layer of cake. 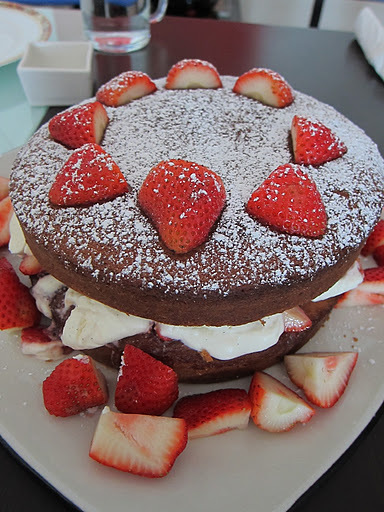 ♥ Dust the top of the cake with icing sugar. While the top can be left naked and traditionally bare, I decorated with strawberries. For the record, that is not my hand! 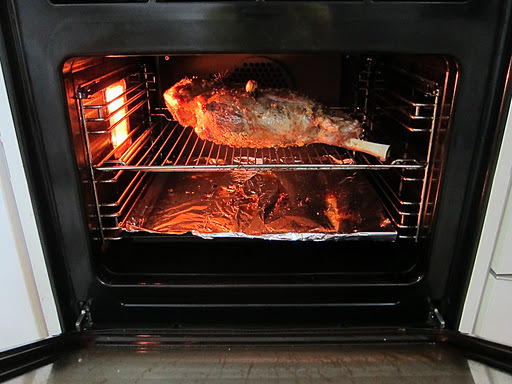 This was my first time using our oven to cook a leg of lamb roast. I bought the roasting joint from Pacific Gourmet – I’m really loving trying out all the online food purveyors and they are my go-to store for meat. Make sure you mention how you want your meat prepared. I made no such specifications, and it was delivered with the rump bone still attached – it makes it harder to carve, and alters the roasting time. I ended up calling Conrad at the Caine Road store for some tips, and he mentioned that I’m lucky I can fit the whole thing in my oven! Usually, he would cut off the rump bone, and sometimes even break the joint so that it can fit in smaller HK ovens. I bought a 3kg bone-in leg of lamb and roasted it, as per Conrad’s instruction, for 1hour and 45 mins – 2 hours (1hr50mins to be exact). I should have take into account that our oven seems more powerful than others I’ve used, so the meat was super juicy, but not as pink as I would have liked. JY kept assuring me that legs of lamb are hard to roast to pink perfection – but I’m sure he was saying it to make me feel better! Next time, I’ll keep it to 1 1/2 hours at 180°C. ♥ Save 8 cloves and 8 little sprigs of rosemary and set aside. Chop the other 4 cloves of garlic finely and chop the rosemary leaves roughly, add them to a bowl with the olive oil and a generous amount of salt and pepper and mix until combined. This way you have a pre-mix to season your lamb without having to keep touching the salt and pepper shakers with lamby hands. 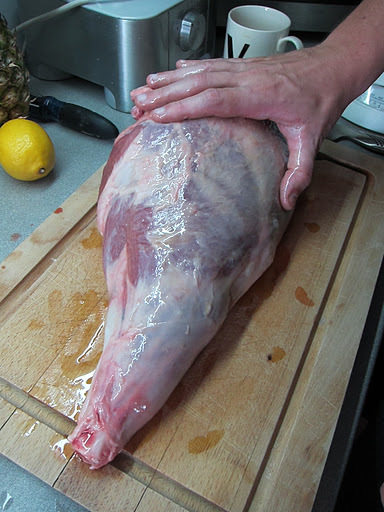 ♥Make 8 randomly-spaced small incisions in the top side of your lamb leg and use your thumb to push through and make a small cavity. Take one whole garlic clove and one sprig of rosemary and stick it in each cavity. ♥ Use your hands to get in there and rub the marinade over the meat so it’s evenly distributed. Leave to sit on the counter for an hour or two to come to room temperature. If making a dessert, prepare the lamb before you start the dessert, so the lamb is ready to pop in the oven right after the cake is done, at 180°C for 1 1/2 hours. 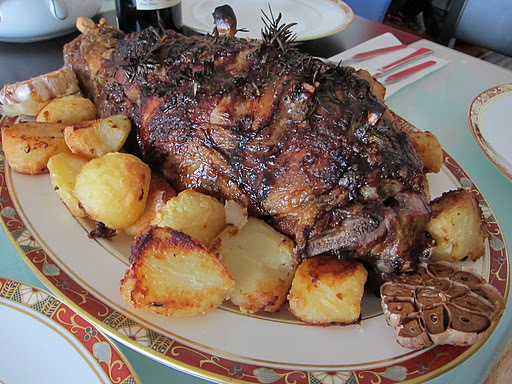 ♥ Place the lamb directly on the rack in the middle of the oven, and cover the tray underneath with tin foil. This way the foil will collect the dripping blood, and the lamb fat/oil will collect separately under the foil – you can use this for roast potatoes. ♥ Prepare one large potato per person (maybe 1 1/2 for the lads), peel and cut into even-sized pieces. Put in boiling water and cook for 10 minutes until slightly soft on the outside. ♥ Drain the water, then put the potatoes back into the pan and cover. Time to work the arms! Shake that heavy pan vigorously up and down and side to side, until the potatoes are really scuffed and broken up on the outer layer – this will crisp up really nicely when roasting. ♥ Place the potatoes in a roasting tin and season with salt and pepper. 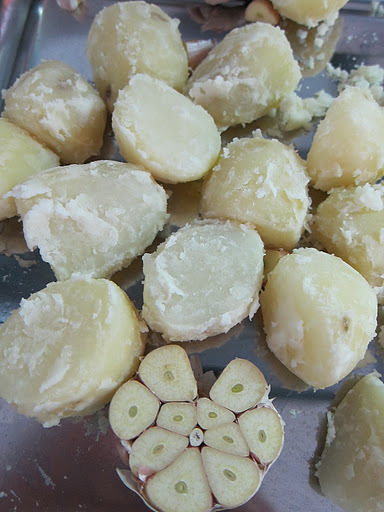 If you wish take a whole clove of garlic and cut it in half to roast with the potatoes – I just love smooshing the roast garlic out of the casing and eating it with the lamb. – Toss the potatoes in the fat to coat evenly. – Put a some new foil on the tray and set the roasting pan with the potatoes on top. – Open up the oven and put the tray beneath the lamb, so the potatoes catch all the yummy juices. – Don’t forget to take the plate out! Once the lamb and the potatoes are finished, leave the lamb on the counter top to rest for 15 minutes. Turn off the oven and leave the potatoes in to stay warm. Prepare any other side dishes that you want to serve. 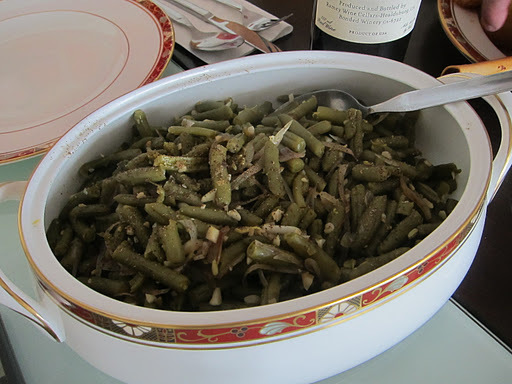 I just did a simple sauteed french beans. Parboil the beans for 5 minutes, then drain. Wipe the pan dry then add olive oil, chopped shallots and garlic, sautee the beans until mixed and the shallots and garlic are cooked but not burnt, season with salt and pepper. JY (a graduate of Cordon Bleu and hence a great guy to have over for lunch! Next time I’ll be inviting him over to cook for me!) suggested we try zesting a lemon over the beans before serving, for a little extra zingyness – an easy but tasty addition I wouldn’t have thought of doing. Arrange a serving dish with the lamb in the center and the potatoes around it. Voila – enjoy! I don’t know much about wine, but my friends bought over some great bottles of wine (thanks guys!) 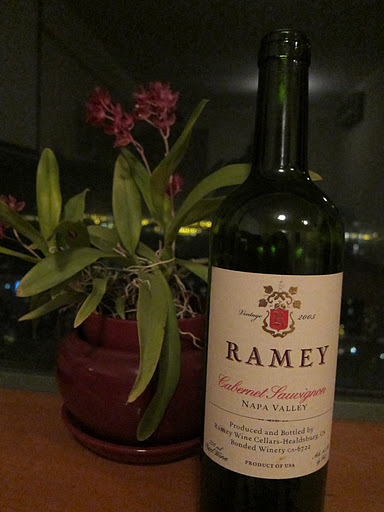 – the full-bodied California red accompanied the lamb really well. We took it surprisingly easy on the alcohol and still have two bottles that we didn’t drink – sounds like another roast is in order, and soon! That looks so good Jen, you should have brought me leftovers!